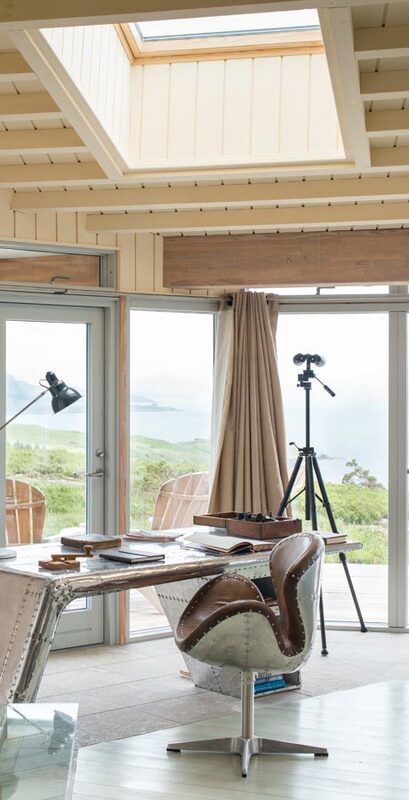 With stunning twenty-mile panoramic views down the Sound of Mull, Eagle Rock is a breathtaking home. Eagle Rock Promo from Roderick James Architects LLP on Vimeo. 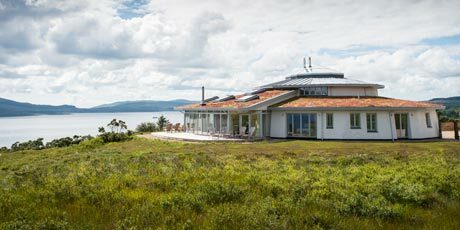 The contemporary yet understated 400m2 four bedroom house sits on a plateau at Achabeag, near Morvern, in a remote part of the West Highlands of Scotland. Owned by architects Roderick James and Amanda Markham, Eagle Rock nestles into the landscape with sedum and lead roofs, lime-harled battered walls and an internal Douglas Fir glulam structural frame. Its unique elliptical shape takes advantage of the incredible views. Eagle Rock was designed by Roderick, Amanda, and their partner at Roderick James Architects LLP, Mike Hope. The house was built as part of Achabeag, a new development of 21 houses. Among the homes is an affordable home prototype that was built as part of the The R-Affordable Homes project, a partnership between Roderick James Architects LLP, The Oswin Project and VELUX. The project aims to build top quality homes whilst tackling inequality and lack of opportunity. Two former offenders were given paid work on the prototype home and taught construction skills such as installing roof windows, bricklaying, plastering, carpentry and painting and decorating. Roderick says the unique elliptical shape of the house not only takes advantage of the views but also, “has a resonance with the old Scottish broch.” Predominantly single storey, Eagle Rock has a high level viewing gallery around a glazed internal courtyard. Downstairs, there are four large double bedrooms with en-suite bathrooms and an open plan kitchen and living room. Two curved staircases lead up to the gallery, which provides additional accommodation as well as a cinema and library. 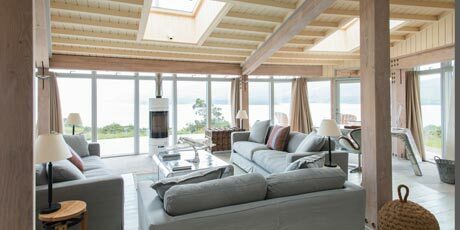 Throughout the house Roderick and his team chose products from VELUX and sister company VELFAC to help make the most of those stunning views. 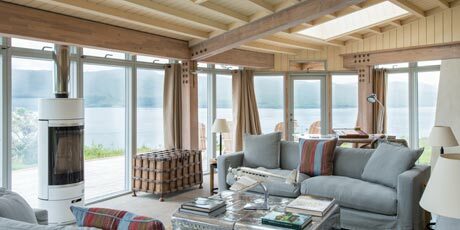 “We've got triple glazing all the way around the outside of the house which was supplied by VELFAC. We have VELUX windows in the main living room area. Because we used high levels of insulation - 450 mm thick of Warmcel recycled newspaper - that means that the VELUX roof lights are situated quite high above the ceiling level. That has two huge advantages. One, it gives us light everywhere in that room. But secondly and most importantly, we don’t get any glare at all. Glare can be a big problem when you’re trying to get light into a room, it can be unpleasant problem in summer. That doesn't happen with VELUX. We’ve also got the added advantage that we can vent the room if needed, just by opening the windows and releasing all the hot air to the outside. The house also has exceptional green credentials. “In terms of energy it costs virtually nothing to run,” says Roderick. 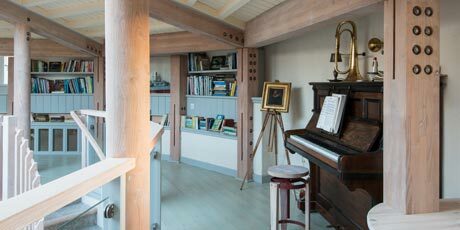 In addition to the 450mm Warmcel recycled newspaper insulation, the house is further heated by a wet underfloor heating system with floor pipes laid 100mm apart for maximum efficiency. A bank of 15kW pholto-voltaic panels provides virtually all of its power requirements throughout the year, supplemented by an 8kW air source heat pump, two woodstoves and off-peak electricity. The house achieves 100% on its environmental impact rating and 99% for energy efficiency. Find out more about Roderick James Architects at www.rjarchitects.co.uk. Light has always been an important element in architecture, and at the pinnacle of this is the use of natural light. Also known as “daylighting,” the aim is to incorporate natural light as much as possible when illuminating interiors by maximising the amount of natural light that can be brought into a building.